FYI! The game might take a minute to load! Use WASD to move, use mouse to look around, and use SPACE to move text forward. Make your way home while having a nice conversation with your mom. 1: What is the game? What's the concept? This is a game where you simply have to walk home while talking to your mom. It's based on my own experiences of calling my mom during my walk home from the subway after my later classes. Over the course of the walk from the subway to my dorm, we'd catch up with each other about what we were up to, and I felt like this small ritual would make a good subject for a small, autobiographical game. 2: What were your problems/successes during development? What were your solutions or workarounds, if any? Getting the text to work was definitely the greatest challenge, although it ended up being a challenge that I circumvented rather than overcame. Trying to get the text to function the way I had originally planned was getting way too complicated, so rather than having massive text trees with dialogue options and stuff, the text ended up being entirely trigger based. With a much simpler dialogue system, I was able to focus on making the text look nice as well as making the area in which you walk in nicer. I had a little trouble with modeling and textures (as evidenced by some of the more noticeably janky texture work), but overall I think I was able to make everything look pretty nice. 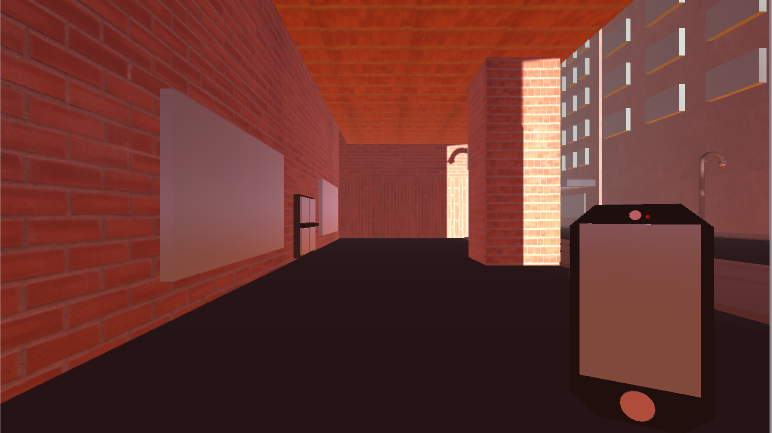 The lighting looks a little funky in the build version (the street and sidewalk in particular), but I wasn't quite sure how to fix that. 3: if you had more time, what else would you do? how would you take this project further? I would definitely add a greater area to walk through, extending beyond just that little block of 14th street maybe over into Union Square Park. I'd also love to implement the dialogue system I had originally intended to have, even if it was a little ridiculous. It'd certainly add for more variety when talking to mom. I'd also try to fix the lighting. Seriously. What's up with that.